So I figure I'll probably do a few of these just to keep you guys updated on my Fitbit usage and also so you can see my progress with it. 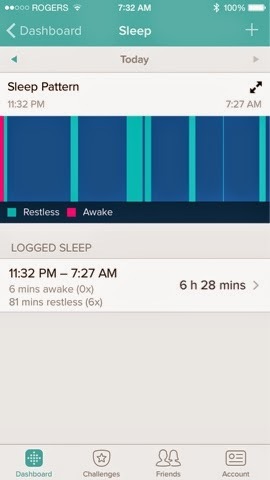 So just yesterday which for you guys would have been a couple days ago I was looking at my Fitbit app and saw that in the sleep settings I had my Fitbit set to normal and there was a setting for sensitive so I decided that I would try sensitive and oh boy what a difference. 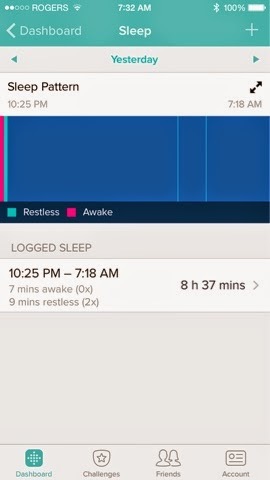 The first picture is from yesterday's sleep and as you can see it looks like I had a pretty great sleep and wasn't very restless at all which is one reason I wanted a Fitbit so that I could track my sleeping patterns due to the fact that I can have a really long sleep but always wake up tired the next morning. So as I say this I looked at my tracker the last few nights before changing the sensitivity and it just didn't make sense to me that I was only restless for a short amount of time. Then we have the second image which shows my sleep from last night which as you can see looks more accurate. I was restless last night for 80+ min in the night and for big periods of time. The second image is what I had expected to find the first night but due to not having the settings set up properly that didn't happen. so now we will see what happens and if it continues to be accurate.